Adobe announced at its Q2 conference call that they already have a version of Flash working for the iPhone and running on emulation software. `We have a version that’s working on the emulation. This is still on the computer and you know, we have to continue to move it from a test environment onto the device and continue to make it work. So we are pleased with the internal progress that we’ve made to date~ - Adobe's CEO Shantanu Narayen said. But will Apple allow Flash for the iPhone? 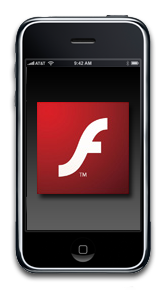 Steve Jobs has claimed in the past that the mobile version of Flash - presumably what Adobe would be porting over to the iPhone - isn’t powerful enough for use on the nimble and elegant iPhone. The push to break away from Flash reliance indicates that Apple isn't keen on seeing iPhone Flash development succeed.That leaves Adobe all alone to tackle the iPhone Flash dilemma.